HAMMADA IS AN Arabic word used to describe “desert pavement.” The deserts of the world that have sand dunes capture the imagination, but many of the world’s desert areas are bleak, stony deserts. Usually, the stony deserts are level plains that are virtually devoid of vegetation and also have very little, if any, soil. These deserts can have a relatively smooth, rocky surface that is hard, like road paving. Hammadas form in regions where the soil is either saline or alkaline, with little ability to absorb water, and winds are strong. Desert paving or hammada (North Africa) is called by a number of names in the different hot and cold deserts of the world. The names are banada, desert crust, deflation armor, desert armor (North America), desert pavement, GOBI (CHINA), gibber (AUSTRALIA), lag gravel or reg (Africa, if the fine material remains), serir (Africa, if no fine material remains) and stone pavement. 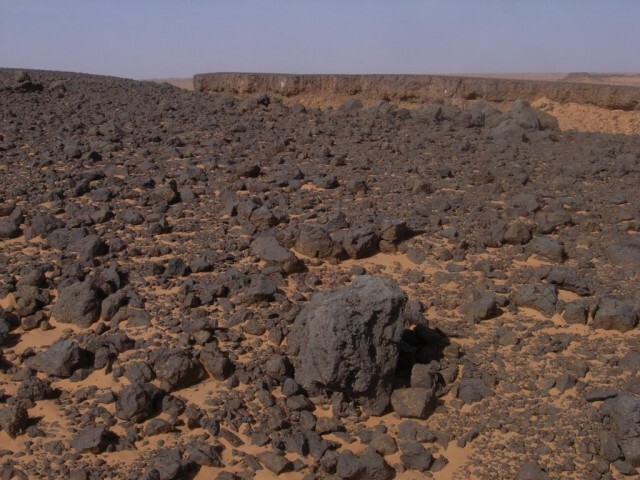 Hammada describes a dark, stony desert surface without sand or vegetation. The dark color is “desert varnish” caused by wind-borne clay particles that carry bacteria living on them. The particles coat the rocks of the pavement coloring them with a dark sheen. Desert regions covered with hammada have a surface that is fairly smooth. The wind has blown away most of the sand, soil, and dust. A layer of rocks on bedrock has formed that is so tightly packed that it forms a solid surface. There may be a layer of soil or dust under the hammada, but it can form directly on top of clean bedrock. The bare rocks that form hammada surfaces are usually relatively small and fit as tightly as a mosaic. Earth scientists describe these rock fragments as either primary or secondary. The primary stones are usually coarse, while the fine secondary material comes from the disintegration of the larger primary material. There are several geomorphic theories explaining how hammada forms. One theory is that the pavement is a lag deposit. This theory says that the rock fragments of the pavement are what remains after the wind has blown away (deflated) all the small, fine-grained sand and dust. A second theory argues that moving water has deflated all of the fine material, leaving the hammada material behind to form the desert pavement. A third theory sees the cycles of wetting and drying of the material as the cause. The exact nature of the process is not fully understood. Some claylike soils expand when wet, which forces stones to move upward. Another theory says that salt acts like water does when it expands or contracts in the freezing or melting process to create a stony surface. Another theory is that hammadas are caused by chilling and heating, as mechanisms that push stones to the surface of the desert and keep them there. Another theory is that several physical processes move the fine particles of sand and dust down between the stones of the hammada surface. Hammada has been found on ALLUVIAL FANS, in dry WADIS, in terraces, on plateaus, on plains, and on bedrock. It is believed that hammada is also on the surface of the windswept planet Mars. Since hammada forms in such varied deserts conditions, it may be that all the theories are correct explanations. The surfaces of many hammadas are hard enough for planes to use as landing strips. Vehicles can travel across the more solid variety, but excessive use can cause dust to rise from particles below the hammada surface. In the Atacama desert of Peru, the ancient Nazca people used hammada to make enormous drawings. Tank battle maneuvers and tank battles in North Africa, KUWAIT, and IRAQ have disturbed large areas of hammada, causing dust and sand dunes to form elsewhere. The damage to these deserts will take many years for nature to repair.